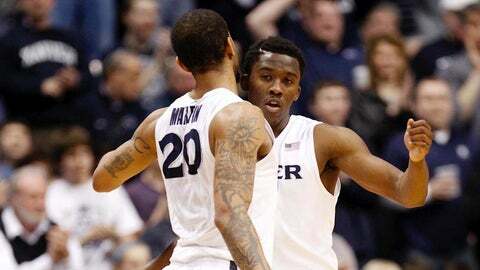 Xavier guard Semaj Christon (0) and forward Justin Martin (20) celebrate during the first half against Creighton. CINCINNATI — With the best game of his career, Justin Martin helped Xavier get the better of a much-anticipated rematch. "Aw, I love it," Martin said. "I love it. I love it. I love it." "In the second half, they made the run and we stuck it out and stayed together," Christon said. "That’s the biggest part of us." "We had a couple of forced ones," McDermott said. "That’s not who we are. We are a team that historically shares the ball. We’ll get back to that. Nothing to worry about here." "We want to come out with the same energy we had tonight, especially at home," Davis said. "With the crowd we had tonight, we can always have energy."